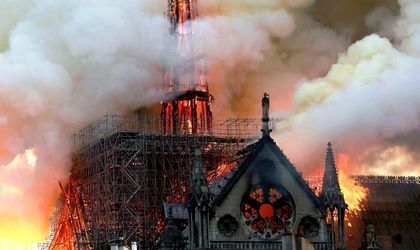 A fire broke out inside the 850-year-old Notre-Dame cathedral in Paris during repair works around 7.00 PM on Monday. The roof collapsed a few hours later, including the spire from the center of the building. UPDATE: Firefighters got the fire under control almost nine hours after it started and were able to save the building’s main stone structure, including its two towers. The intervention also helped to rescue valuable artwork and religious items. French President Emmanuel Macron said that the “worst has been avoided” as Notre Dame’s main structure was preserved. He said that he would launch an international fundraising scheme for its reconstruction. Billionaire François-Henri Pinault, chairman and CEO of the Kering group that owns the Gucci and Yves Saint Laurent fashion brands, has already pledged EUR 100 million towards rebuilding Notre-Dame, AFP reports. The cause of the fire was linked by the officials to the renovation works on the Gothic building, and the fire is being investigated as an accident. Deputy interior minister Laurent Nunes told reporters it was not certain that the Cathedral could be saved, according to BBC News. French President Emmanuel Macron arrived at the scene and said that his thoughts were with ”all Catholics and French people.” He cancelled an important TV speech to the nation because of the fire. Notre-Dame Cathedral is one of the most important symbols of France, built in the 1200s. The last time it suffered major damage was during the French Revolution and it has survived two world wars without severe damage.